Do not start drinking until everybody at the table has a drink and the glasses are raised for a drinking salute, which usually is "kampai". When drinking alcoholic beverages, it is customary to serve each other, rather than pour your own drink. Periodically check your friends' cups and refill their drinks if their cups are getting empty. Likewise, if someone wants to serve you more alcohol, you should drink some from your glass before holding it towards that person. 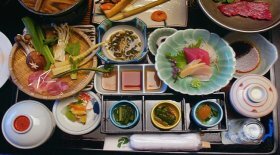 While it is considered bad manners to become obviously drunk in some formal restaurants, for example high-end restaurants that serve kaiseki ryori (Japanese haute cuisine), the same is not true for other types of restaurants such as izakaya, as long as you do not bother other guests. If you do not drink alcohol, it is not impolite to say so and request for other beverages instead. Non-alcoholic beverages that are usually available include alcohol-free beer, tea, juices and carbonated drinks. Hold the rice bowl in one hand and the chopsticks in the other. Lift the bowl towards your mouth while eating. Do not pour soy sauce over white, cooked rice. You do not need to add wasabi into the soy sauce, as sushi pieces that go well with wasabi will contain it already. However, if you choose to add wasabi, use only a small amount so as not to offend the sushi chef. If you do not like wasabi, you can request that none is added into your sushi. Pour some soy sauce into the small dish provided. Put some wasabi on the sashimi piece, but be careful not to use too much as this will overpower the taste of the fish. Dip the sashimi pieces into the soy sauce. Some types of sashimi are enjoyed with ground ginger rather than wasabi. Drink the miso soup out of the bowl as if it were a cup, and fish out the solid food pieces with your chopsticks. Using your chopsticks, lead the noodles into your mouth. You may want to try to copy the slurping sound of people around you if you are dining in a noodle shop. 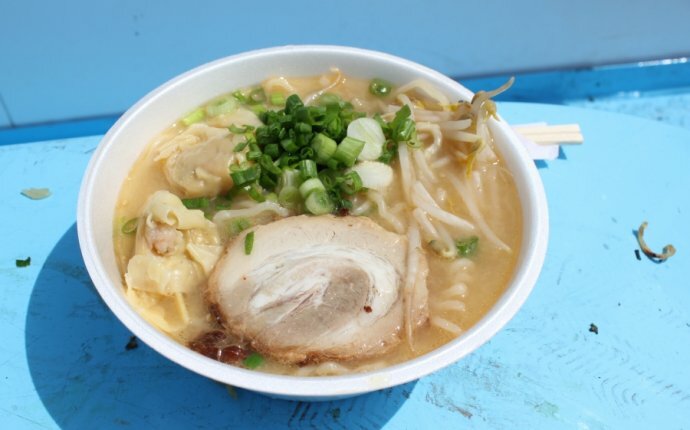 Rather than being bad manner, slurping noodles is considered evidence of enjoying the meal and enhances the flavor. In case of noodle soups, be careful of splashing the noodles back into the liquid. If a ceramic spoon is provided, use it to drink the soup; otherwise, lift the bowl to your mouth and drink from it directly.